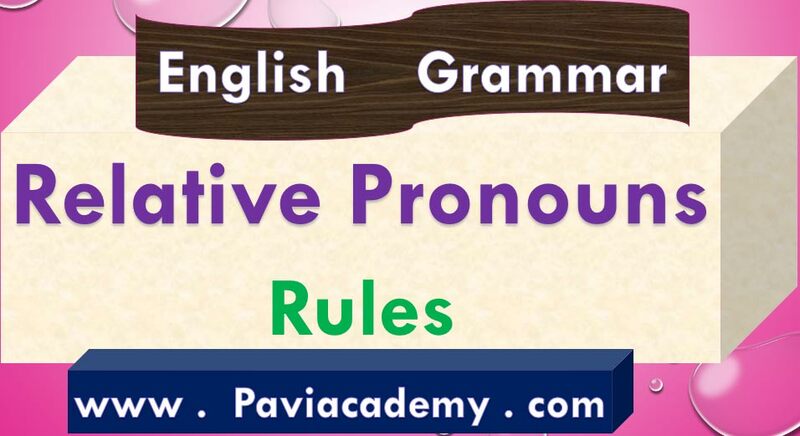 This paviacademy.com article is about Relative Pronouns Rules For Academic and Competitive Examinations With Telugu explanation. 1 . who , whose , whom are generally used for persons only . సాధారణంగా who , whose , whom మనుష్యులకు మాత్రమే ఉపయోగింపబడును . The boy who is honest is trusted . This is the woman whose husband was killed in an accident . Whom the gods love , die young . This is Ravi whom I used to know as a boy . He who is contented is rich . They never fail who die in a great cause . They also serve who only stand and wait . 2 . ‘ who , whose , whom ‘ are sometimes used for animals and inanimate things . who , whose , whom లు కొన్ని సందర్భాలలో జంతువులకు , ప్రాణములేని వస్తువులకు ఉపయోగింపబడును . A triangle whose three sides are equal is called an equilateral triangle . The ancients worshipped moon whom they called Diana . The Sun , whose rays give life to the earth , was worshipped by the ancients . 3. ‘ which ‘ is used for animals and things without life . జంతువులకు , ప్రాణములేని వస్తువులకు ‘ which ‘ ఉపయోగింపబడును . Mangoes which are ripe are sweet . The book which was lost was not hers . The moment which is lost for ever . The dog which barked at her did not bite her . This is the horse which won the race . 4. ‘ which ‘ is also used to refer to a previous statement. పూర్వం చెప్పిన విషయాన్ని సూచించేందుకు కూడ ‘ which ‘ ఉపయోగింపబడును . The man said he was a doctor , which was not true . He wants me to give up my claim , which was impossible . You have paid your debts , which ( = the face that You have paid your debts ) is a clear proof of your honesty . He said he saw me there , which was a lie . 5. ‘ That ‘ is used for persons and things . It has no Genitive case and it is never used with a preposition preceding . It has a restrictive force . ‘ That ‘ వ్యక్తులకు , వస్తువులకు ఉపయోగింపబడును . దీనికి possessive case లేదు . దేని ముందు preposition రాదు . ఇది దానిచేత విశేషించబడే నామవాచకమును పరిమితము చేస్తుంది లేక నిర్వచిస్తుంది . This is the boy that won the first prize . Here is the man that I told you of . Who that has met him can escape his influence ?. This is the house that Ravi built . 6. ‘ That ‘ is used in preference to ‘ who ‘ or ‘ which ‘ in the following cases . ఈ క్రింది సందర్భాలలో who , which లకు బదులు ‘ That ‘ ఉపయోగింపబడును . 1 . After Adjective in the Superlative Degree . Superlative Degree లో ఉన్న Adjectives తరువాత that వస్తుంది . This is the best that we can do . This is the best picture that I ever saw . He is the wisest man that I ever met . 2 . After the following words . ఈ క్రింది పదముల తరువాత That ఉపయోగింపబడును . All , same , none , nothing , any , ( the) only . He is the same man that he has been . Man is the only animal that can laugh . 3 . After the Interrogative Pronouns ‘ who ‘ and ‘ what ‘ . Interrogative Pronouns అయిన who , what ల తరువాత That వస్తుంది . Who that saw her did not pity her ? Who am I that I should object ? What is it that troubles you so much ? What is there that I do not know ? 4 . After two antecedents one denoting a person and the other denoting an animal or a thing . ఒక వ్యక్తిని , ఒక జంతువును లేదా వస్తువును సూచించే 2 antecedents ( noun or pronoun ) ఉన్నప్పుడు That వస్తుంది . The boy and his dog that had trespassed on the club premises were turned out . 7 . ‘ what ‘ is used for things only . వస్తువులను సూచించేందుకు మాత్రమే ‘ what ‘ ఉపయోగింపబడును . I say what I mean . He found what he was looking for . Take down what I dictate . What cannot be cured must be endured . 8 . ‘ As ‘ is used as a Relative Pronoun after ‘ such ‘ and sometimes after ‘ the same ‘ . ‘ such ‘ , ‘ the same ‘ ల తరువాత Relative Pronoun గా ‘ As ‘ ‘ ఉపయోగింపబడును . He is such a man as I honour . My trouble is the same as yours . His answer was such as I expected him to give . Yours is the same book as mine . 9 . After a Negative , the word ‘ but ‘ is used as a Relative Pronouns in the sense of ‘ who …. not ‘ or ‘ which …. not ‘ . వ్యతిరేకార్ధము తరువాత ‘ ఎవరు కాదు ‘ , ‘ ఏది కాదు ‘ అనే అర్ధములో ‘ but ‘ Relative Pronoun గా ఉపయోగింపబడును . There is no Hindu but knows ( = who does not know ) the story of Ramayana . There is no rose but has ( = which does not have some thorn ). 10 . The Relative Pronoun is generally omitted when it would be in the objective case . objective case లో ఉండవలసినప్పుడు Relative Pronoun సాధారణముగా వదలి వేయబడుతుంది . I am monarch of all ( that ) I survey . Be loyal to the friends ( that ) you have . Here is the book ( that ) you were looking for . 11 . A Relative Pronoun must agree with the number and person of its antecedent . Relative Pronoun అది సూచించే నామవాచకము లేక సర్వనామము యొక్క వచనము , పురుషలలో ఉండాలి . The boy who was lazy was punished . The boys who were lazy were punished . I who am your king will lead you . You , who are mighty , should be merciful . They , that were caught , were hanged . 12 . The Relative Pronoun should be placed as near as possible to its Antecedent . Relative Pronoun దాని Antecedent కు సాధ్యమైనంత దగ్గరగా ఉండాలి . The boy who won the first prize is the son of Mr . Rama Rao . 1. where is the book that I gave you ? 2. It is the same case as I told you ? 3. where is the man whose purse was lost ? 4. That man who will not work must starve . 5. These mangoes are not such as I bought yesterday. 6. I don’t believe what you say. 7. whom the Gods love die young. 8. we met the sailors whose ship was wrecked. 9. Do you know what has happened ? 10. They who seek wisdom will be wise.